Mom, the Intern: I'm "sensitive" about bugs, OK? I'm "sensitive" about bugs, OK? When I became a home owner and started finding all sorts of weird bugs in my house (like the massive palo verde beetle ... I still shudder at the memory), I started thinking about pest control. I knew I didn't want evil, Satanic creepy-crawlies infiltrating the sacred walls of my home, but I also didn't want to pay out the nose for a "bug guy" and didn't really trust them, either. Certainly, some kind of effective "over-the-counter" bug killer had to exist and I was determined to find it. That's when my mom told me about Raid Max Bug Barrier . It's safe for indoor and outdoor use and is supposed to last 12 whole months after application. You can get it basically anywhere -- Wal-Mart, Home Depot, Lowe's, Target, etc. You can buy it in a small size or the big size, but both come with battery-powered ... uh, squirter-nozzles. Nozzles that shoot the stuff in a fancy line, just like the pros. My mom advised me to spray the stem wall and doorways of my entire house and watch the magic happen. I was skeptical but I had nothing to lose. Let me just tell ya, the advertising doesn't lie with this product. I still do occasionally find nasty bugs (including roaches ... gaaaah) in my house but they are always either dead or dying. And yes, I'm scared of the dead ones too, but I can handle them/pay my kids to handle them. The other good news is it's very affordable. That entire 128-ounce jug up there is about $20 - 25 ... already cheaper than a month of pest control. And even though it really does work for a year, I personally spray once every couple of months just to be sure (shocking, I know). I've had my 128-ounce container for over a year now and there's still about half left. Granted, I live in a two-story with a pretty small footprint, but I am pretty generous with the spray. As you might imagine. I've never had cause to spray my upstairs until the other night. I went to bed as usual and awoke a few hours later to a distinct stinging feeling on my bum. It wasn't super-painful but worrisome nonetheless. Naturally, my brain jumped straight to "SCORPION!" so I decided to head to the bathroom to investigate. Lo and behold, there within my undies was an EARWIG!!! (not a scorpion). It had been pinching my hind for no reason whilst I innocently slept. Sick. So, the upstairs is getting a hosedown TODAY. I'm confident the only earwigs left will be cadavers. I'm totally OK with that. 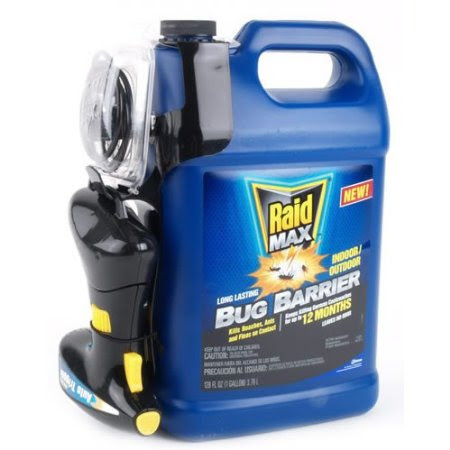 If you have a bug problem like I do and don't want to pay for pest control, you should really consider picking up some of this Raid Max stuff. It basically saves my sanity every summer. Before Raid Max, I was scared to go downstairs in the event a nasty creature was waiting for me. Now, I'm just slightly fearful at the rare chance I'll find a dead thing on its back in the corner. Much better, right? P.S. -- I wasn't paid to write this post. I just really, REALLY like this stuff. what the heck?? in your undies? that just freaked the heck out of me. gonna be wearing the extra tight kind tonight! Haha! I WAS wearing the extra-tight kind, if ya know what I mean. I have no idea how they got in there! And by "they," I mean "it." There was only one. In your UNDIES??!! That's flippin disgusting! I found one of those earwigs in my inhaler once but undies is way worse. The RaidMax people should pay for your therapy b/c of the free plug. In your INHALER?!? Who do these bugs think they are? I don't even want to google earwig! OMG. ahahaha! i feel like i could have written this post myself! except that my hubby and i are so paranoid that we actually did call an exterminator! i wont even tell you how many spiders he found in our backyard. sick sick sick.